Joe Gaziano recovers a fumble. 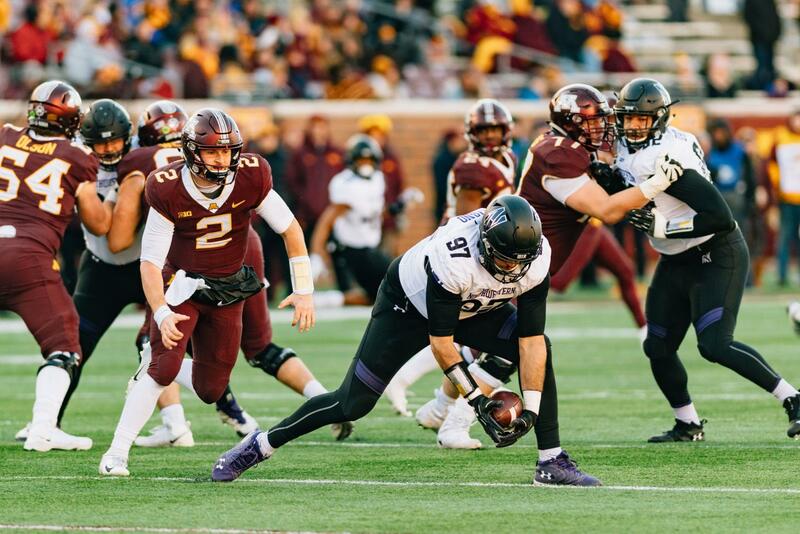 Northwestern's defense came up huge in a win at Minnesota. MINNEAPOLIS — Pat Fitzgerald was insulted. To start the week, he faced a barrage of questions about whether his Wildcats would stay focused in their final two conference games. Then the line on Saturday’s game at Minnesota shifted so heavily that No. 22 Northwestern went from 2-point favorites to 2-point underdogs. He stewed over a compendium of negative comments compiled about senior quarterback Clayton Thorson. His team got the message. They never trailed against a decent Golden Gophers (5-6, 2-6 Big Ten) team, using a stout defensive effort and a fourth-quarter offensive burst to pull away for a 24-14 victory at frigid TCF Bank Stadium. The victory was the Cats’ (7-4, 7-1) sixth straight in conference play and an eighth consecutive Big Ten win away from Evanston. NU’s performance was far from a perfect one. The Cats had just 147 yards of offense in the first half, failed to convert two ugly fourth-and-long plays deep in Minnesota territory and didn’t take a two-score lead until the fourth quarter. But NU nevertheless displayed a “businesslike” effort, Fitzgerald said, and scored when it needed to. The Cats answered a game-tying drive late in the first half with a three-play, 55-yard spurt, driven by two long Thorson completions and an 11-yard quarterback keeper for the go-ahead touchdown. NU led for the final 31 minutes of game time, and extended its advantage early in the fourth quarter with a 92-yard drive highlighted by a 68-yard connection between Thorson and freshman receiver JJ Jefferson. Freshman running back Isaiah Bowser later punched in his second score of the afternoon, and the Cats moved ahead by three scores with a field goal — set up by a fumble recovery — shortly thereafter. Minnesota, meanwhile, struggled mightily to effectively move the ball. Beyond three turnovers, the hosts crested 300 yards of total offense only in the final minute, and the Golden Gophers went nearly two full quarters without scoring. It was an impressive defensive performance for an NU unit missing several regular starters, including three in the secondary alone. The Cats were especially effective at stopping the hosts on short fields. On three separate occasions, Minnesota drove inside NU’s 30-yard line only to give the ball back to the Cats without scoring. Sophomore safety Travis Whillock, who had a team-leading 15 tackles, attributed that effort to a well-executed “bend, don’t break” mentality. That stoutness allowed the Cats to win comfortably on a day when they tallied only 325 yards of offense and Bowser failed to reach 100 yards on the ground for the first time in six weeks. NU was also hamstrung by the loss of leading receiver Flynn Nagel, who left injured early in the game, and kicker Drew Luckenbaugh, which forced the Cats to rely on punter Jake Collins for kicking duties. For Fitzgerald, however, the personnel travails were moot. His team came to practice prepared, he said, and “won this game on Tuesday.” And instead of resting starters with the division title already in hand, NU sought to attack another opponent. The coach had plenty of fuel to add to the fire.